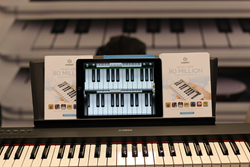 Music application company, Gismart was a highly anticipated guest at this year’s National Association of Music Merchants (NAMM) tradeshow in Anaheim, California. Music application company, Gismart was a highly anticipated guest at this year’s National Association of Music Merchants (NAMM) tradeshow in Anaheim, California. The excitement surrounding GIsmart’s participation is due to the company’s innovative approach to the mobile instruments and a record of more than 80 million downloads overall combining the users of Gismart music-related app. More and more music companies are seeking to partner with mobile-focused groups like Gismart. Although, the overwhelming attention that Gismart received at the show was not entirely from corporations, but also from education groups as well. All areas of the industry have a vested interest in integrating new sounds and opportunities for music-based applications. Gismart has been creating high-quality musical mobile applications since 2013. The group is best known for the intuitive nature of their apps and the user’s ability to share their experiences. The success of Gismart’s appearance at the show is due partly to the fact that the company’s platform is intended for customization and personalization, which allows Gismart to expand on the partnership model. The idea for attending the event this year is to make clear to the “who’s who” of the industry that Gismart is open for partnerships and that the interface is designed for collaboration. Brands can reach their targeted audience through Gismart well established platform and dedicated users. For more information on mobile applications, visit https://goo.gl/Isous3 (Google play) or https://goo.gl/HmTyp8 (App store). Gismart has been producing high quality music apps for iOS and Android since 2013 with a driving passion for music and mobile. With easy to use mobile, musical instruments people are able to connect and share the experience worldwide. The community of Gismart users is constantly growing and the team is working hard to update apps to make them even more user friendly. Gismart is also working with real musical instrument brands and production companies to enrich the experience and make the apps as realistic as possible.